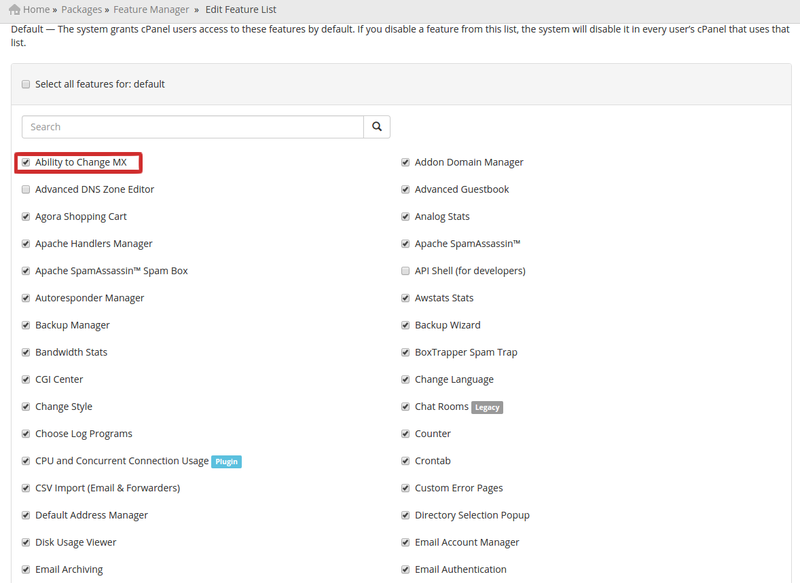 The below guide is for integrating the Cpanel Spam Filter add on. If needed, under "Remote Access Key" (now available, after the last step) click "Generate New Key". For Local Cloud: Exim Configuration Manager > Basic Editor > Access Lists > "Only-Verify-Recipient"
* A rerun of the installer will not overwrite the add-on configuration. 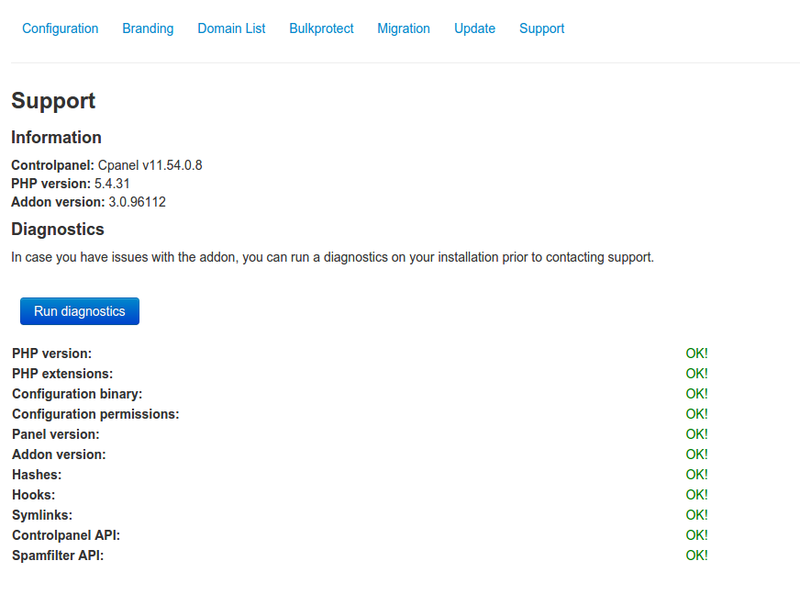 cPanel running from stable/release/current versions only (we cannot support edge). LTS versions are not supported. The "Change MX" feature has to be enabled in the feature list. To enable this, go to: Packages > Feature Manager, click on Edit Feature List and tick the “MX entry” box. This should be enabled by default. The cPanel part of the addon provides the enduser a (brandable) icon in their control panel, allowing them to see their domains and login to them. To reach this section look for "List Accounts". It will display a list of domains for which the Cpanel Addon has been installed. If you click the Cpanel orange icon next to each domain, this will automatically log you into the spam filter, and allows the management of the full antispam settings for the domain. The configuration panel contains all the necessary settings to allow full flexibility for the addon. In most cases, the default settings are sufficient but can be altered to suit your needs. On mouseover a tooltip with the option description will be displayed. Be Advised: If you want to use this addon on our Hosted Cloud there are some additional steps required. The domain list shows you all the local domains and offers an option to check if it is protected, exists in SpamFilter, and to login to it. Clicking “Check Status” or “Check all domains” will check if the domain is added to the filter. 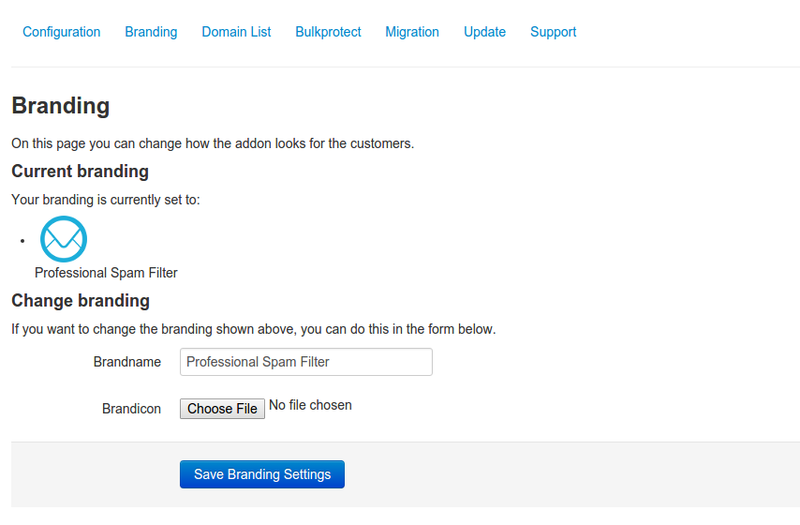 Using the “Toggle Protection” you can either add or remove the domain from the SpamExperts Control Panel. The Bulk Protect option allows you to protect all domains on the local system. Clicking bulk protect will execute the bulk protect system. This may take some time as it has to iterate through all domains (account, addon, parked) and execute all of the various tasks involved in protecting the domain (for example: adding it, changing MX records, setting email address for reports). The migration process requires you to enter the new user's username and password, to verify you have access to that account. During the migration, the domains will be assigned to this new user. Once the process is complete, it will update the username and password for the addon configuration. We strongly recommend each cPanel server to use it's own Control Panel API credentials. Whenever you move an account from one cPanel server to another, you should first transfer the ownership of the domain from the old web interface user to the new one. That way, the old cPanel server does not have access to the domain anymore (and won't delete it), whilst the new server does have access (to allow the client to log in). The addon can auto-update itself to the latest version. On the update page you can change what type of updates you'd like to receive, manually update it or reinstalling the current version. We highly recommend you use the stable builds at all times, as these are the tested and preferred builds. The testing and trunk builds are updated more often but may contain bugs. The support page shows you basic information about which versions are being used and generates a special code. The special code contains a collection of data used by support to be able to support you better. When asking support, please provide this information. What URL is being used to manage the Spamfilter? This can be the primary hostname of your cluster, or a CNAME you're using. Please note that if you want to use https://, you will need to configure SSL support for cpsrvd. This URL will be validated. If this is not a Control Panel URL, you will be informed. The hostname is being used to interface with the API. This is the hostname of your masterserver. The API username should be a (sub)admin or admin account. We recommend you to use a separate (sub)admin user for each cPanel server. For security reasons, it’s not recommended to user Superadmin credentials. Also please ensure not to use a “Software API” user. API password is the one that belongs to the API user. The combination of hostname, username, password and SSL enabled/disabled is being validated. If the login fails, you will be informed so you can make the appropriate adjustments. The Primary MX record (MX10). You can select which TTL the addon should use when creating MX records for the domain it is protecting. Use SSL for API requests. Please note that this will require cpsrvd to be compiled with OpenSSL. This checkbox will be unchecked/greyed out when your PHP version/server doesn't support OpenSSL. Updates are being performed once a week to make sure the addon is running the most recent version. If you tick this box, the addon will periodically check if updates are available. If there is an update, it will be installed automatically. You can also update manually through the addon's “Update” feature. If you want the addon to create new domains in the SpamExperts Control Panel when it is being added to cPanel, tick this box. If you want the addon to remove domains from the SpamFilter when they are being removed from cPanel, tick this box. If you want the addon to change the MX records for your domains, tick this box. This option uses the Primary/Secondary/Tertiary MX records to provision the DNS for a new domain or when you're executing Bulk Protect. Automatically sets the contact address for the domain in the Spam Filter. Using this, customers can leverage the "Retrieve login link" feature if they forget their password and will start receiving Protection Reports for their domain. For protection reports, the default settings are used. This function will work only if your account has an email address attached in cPanel. If you want the addon to handle addon and parked domains, tick this box. Add addon- and parked domains as an alias instead of a normal domain. 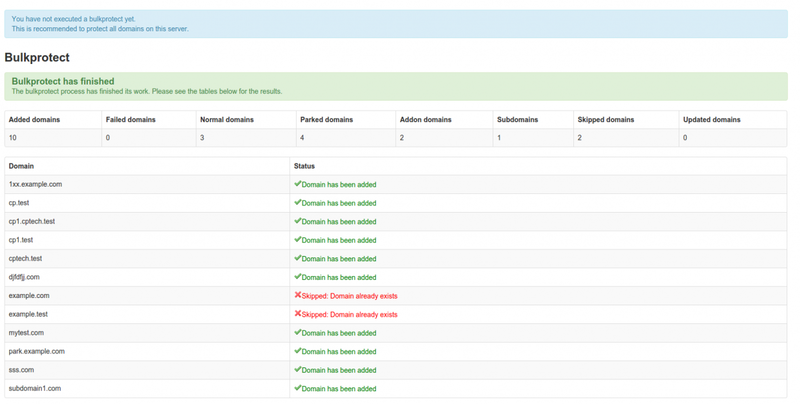 If this box is unticked, and the previous one ticked, domains will be added as normal standalone domains. That is the recommended value. If you tick this box (and the previous one is ticked), addon- and parked domains will be added as special domain aliases for the root domain. We strongly recommend to leave this feature unticked, as addon/parked domains may have different mail rules setup and hence email may malfunction as the account does not exist on the main domain. Use existing MX records as routes in the SpamFilter. If you tick this box, instead of the server hostname the original MX records for that domain will be used as destination hosts. You can use this for specific server setups, such as Google Apps. This will skip protecting domains that are set to “remote”. When a domain is set to “remote”, the email handling is not done by this box. By using this option and “use existing MX records as routes in the SpamFilter” you can transparently have the domain protected since it will then use the existing MX records, which point to the remote server, to have the Spamfilter deliver mail to. Tick this box in case you want to have the user redirected back to cPanel when they click the logout button in the SpamExperts interface. This function will add the domain to the filter, in case the domain does not exist during login. This is useful to auto-protect domains during login, in case they are not protected yet. Force changing route & MX records, even if the domain exists. This will change the route to this server and MX records in case the domain already exists. 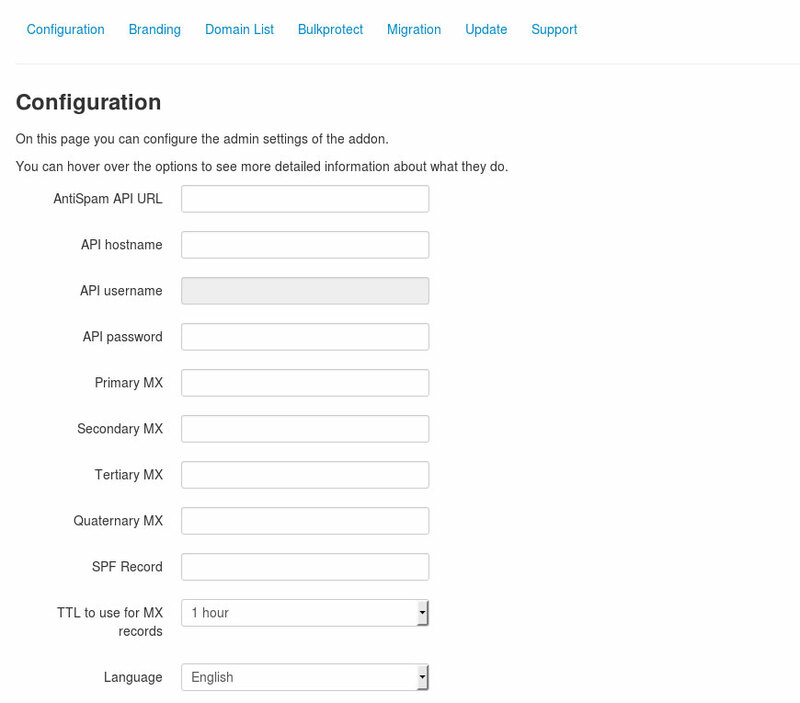 This functionality can be used in case you are frequently migrating domains between multiple cPanel boxes. Change email routing setting "auto" to "local" in bulk protect. The “email routing” setting can be set to “local” (this server handles email) in case the domain is set to “auto”. Auto is a dangerous setting that may lead to issues in the email delivery. By ticking this box, domains set to “auto” will be changed into “local”. When the email routing is being changed in the “Edit MX records” setting, you can have the addon automatically remove the domain if it is set to anything but local or add the domain if it is switched to local. With this turned on all newly added domains should have destinations represented with IP addresses. With the option turned off the destinations should be hostnames. Go on the left to "EasyApache (Apache Update)"
Choose "Start customizing based on profile"
Continue with the next steps, until you can go to "Exhaustive Options List"
Ensure to select "OpenSSL" and "CurlSSL", click "Save and build"
Use WHM's EasyApache 4 interface (Home >> Software >> EasyApache 4). The above example installs the ea-php56-php-gd package, where 56 represents the PHP version and gdrepresents the extension name. cPanel v54 has introduced some changes to the X3 theme which they have officially deprecated and plan to remove by the end of 2016. Unfortunately this can cause an issue with our plugin's icon for that particular theme, which might no longer be displayed properly. More details about X3 theme deprecation and scheduled removal can be found in cPanel's blog post here. We would strongly advise our customers to no longer use the X3 theme starting with v54 and switch to the new default one that cPanel recommends instead, for which they've also added a 'Retro' styling option to make it look like X3. However, if anyone still wants to use X3 theme on v54 for any reason and has an issue with our plugin's icon not being displayed properly, the following cPanel script can be used to fix the issue: '/usr/local/cpanel/bin/rebuild_sprites`. There are two parts of enabling debug mode, one is enabling debug mode for the addon and the other is to have syslog save debug-level logs. Both steps are required to successfully enable debug level logging. This feature should only be enabled when there is a problem and you want to debug it. We recommend to enable debugging when there are problems (white pages, unexplainable errors). This mode logs quite some information to the log file and starts displaying more errors in the Control Panel. First, you must change your syslog settings. cPanel (or CentOS) has a default setup which ignores the "DEBUG" entries. In case you want to keep this enabled for a longer period, you might want to add it to the log rotation configuration. The log will be stored on /var/log/debug. The system automatically updates itself (when enabled), and can optionally be updated manually via the web interface. If you experience any issues using the web-based/automatic updater, please contact our support. You can always run the installation command as above to force a new install of the latest version of the add-on, all settings will remain preserved. The above command will just uninstall the addon, but all added domains will still be protected as mail will be routed through the SpamExperts system and the MX Records will still point to your Local or Hosted Cloud solution. In case you need to downgrade to a unsupported version, (for example when a WHM version becomes LTS or EOL), you need to use the following instructions. Please note that support for a older version is not supported. This should only be used in emergencies. It is strongly recommended to upgrade your WHM platform to a supported version. Replacing x.x.xxxxx with the addon version number you wish to downgrade too. 2: Disable the "automatic updates" from the addon settings page.